Premium Mobile Pedestal File Features Durable Construction To Withstand Intense Daily Use. Two Box Drawers Include A Pencil Tray And One Divider Per Drawer To Help Organize Your Supplies And Belongings. The File Drawer Accommodates Letter-Size Hanging File Folders With The Included Hangrails. Secure The Contents With The Core-Removable Lock. Premium Arch Drawer Pulls And Clean Style Integrate With Most Office Environments. Precision Ball-Bearing Suspension And Full Drawer Extension Deliver Optimal Performance. Counterweight Guards Against Tipping. Greenguard Gold Certified Pedestal File Meets Or Exceeds Applicable Ansi/Bifma Standards.. 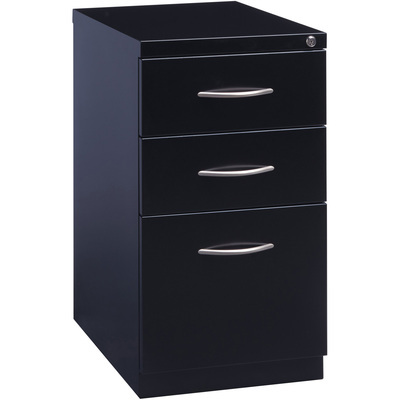 Premium Mobile Pedestal File Features Durable Construction To Withstand Intense Daily Use. Two Box Drawers Include A Pencil Tray And One Divider Per Drawer To Help Organize Your Supplies And Belongings. The File Drawer Accommodates Letter-Size Hanging File Folders With The Included Hangrails. Secure The Contents With The Core-Removable Lock. Premium Arch Drawer Pulls And Clean Style Integrate With Most Office Environments. Precision Ball-Bearing Suspension And Full Drawer Extension Deliver Optimal Performance. Counterweight Guards Against Tipping. Greenguard Gold Certified Pedestal File Meets Or Exceeds Applicable Ansi/Bifma Standards.